Last year marked the first time in about 50 years that a BC Electric Rail car ran in Surrey. A fleet of the electric train cars use to run throughout the lower mainland, around Vancouver, and out to Chilliwack, BC on a regular basis. As cars and roads got more popular, fewer people used the train, so the service folded into history. Over the last few years, volunteers in the Fraser Valley Heritage Rail Society put in thousands of hours and lots of sponsor dollars restore one of the few remaining cars to working order. With that car operational, they’ve started on a couple of more, for a small fleet, and they’ve built a station for the works. It’s becoming quite a tourist attraction for the area. 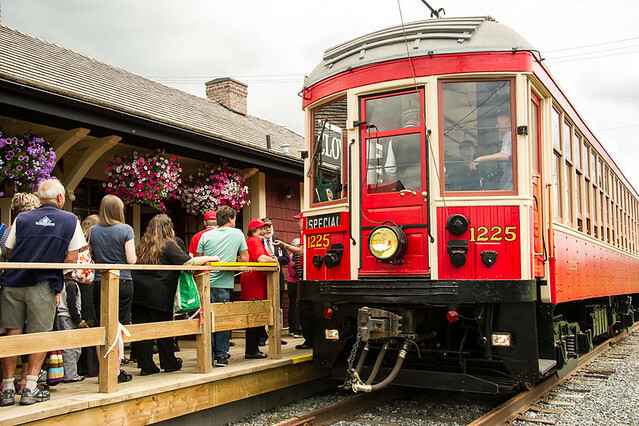 Throughout the summer of 2013, the restored car (BCER 1225) ran between the Cloverdale and Sullivan neighbourhoods in Surrey, about a 55 minute round trip. When the season had closed, over 5000 people had taken the trip, and some had taken it multiple times. Not bad for the first year! They’ll be opening up again May 11, 2014, and the train will run for most of the day on Saturdays and Sundays throughout the summer. Here’s wishing them luck. After reading on Miss 604’s blog about Snowy Owls being seen around Boundary Bay, I headed out to Boundary Bay Regional Park to see what I could see. 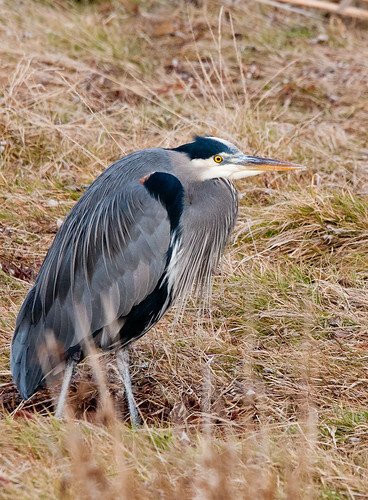 No Snowy Owls for me, but I did spot a Great Blue Heron that seemed somewhat ok with me taking a few shots. I took a couple of photos right away with my D700 and s/he didn’t seem too concerned about me stopping along the trail. After that, I pulled off my pack and got out the D300 with a Sigma 120-400 lens a knocked off a few more shots. By then, the heron had scrunched it’s neck down and kind of looked like s/he was saying – “what are you going to do next. Should I take off or not”. As it turned out, I was the one that took off and the heron went back to doing what herons do in the middle of a regional park. There were a few eagles around the farms near the Delta airport, but they were too far out to catch a good shot. I’ll try another day. I’ve sussed out a few places to get back to now. On another note, when I was looking up the link for the Snowy Owl post on Miss 604, I ran across a photo I took out at White Rock a while ago. It was in a post about ‘Bite of White Rock’, an annual restaurant event aimed at getting people out to sample the local scene in January and early February. That’s neat to get a photo credit on a popular blog like Miss 604. Thanks Rebecca! 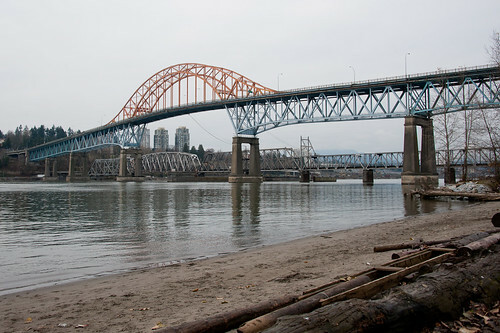 This is a photo of the Pattullo Bridge that connects Surrey to New Westminster BC. It was build in the 1930’s and has served the connection well. It’s narrow by today’s standards, but at least it has 4 lanes, unlike the Lions Gate from Vancouver to North Vancouver which has 3. Wikipedia has a nice page on the Pattullo Bridge here http://en.wikipedia.org/wiki/Pattullo_Bridge. There is a plan in progress to replace this bridge in the not too distant future. It handles an incredible amount of traffic in and out of Surrey, so it will be interesting to see how they handle that during the construction/destruction when it happens. There are rumours that they’ll decide to toll the new bridge. That’s not sitting well with folks that live south of the Fraser River in Surrey, White Rock, Delta, Langley, Aldergrove, etc. As it is we’ll have tolls on the Golden Ears and Port Mann bridges by the end of next year and if those crossings are used, it will cost close to $1200-$1500 a year more for a daily commute into Vancouver, New Westminster, Burnaby, Coquitlam, etc. That’s a lot for a struggling family that has to commute to survive. Not sure that’s really fair either, given that we’ve all contributed to the lovely rapid transit and bridges north of the Fraser. Now the only ones getting dinged extra to get around are the folks south of the Fraser, and they don’t have adequate transit either. Spent some time on Vancouver Island over the weekend. It was great to see the family again for a couple of days. Just before I left on Saturday afternoon, we went to Sidney, near the BC Ferry terminal, for a quick coffee and some photos. Lesson learned. Two o’clock in the afternoon is not the golden hour for photography. The light was harsh, the crowds were dense, and we only had an hour or so before I had to catch the ferry. Next time I’d like to spend an early morning or late afternoon taking some pictures there for a couple of hours. 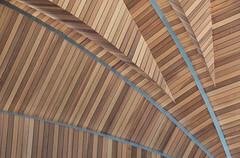 Still, we did find some interesting shots. My nephew brought his D80 along, and I had my D300. We ducked and bobbed around, grabbing what shots we could. This one is of a new bandshell or stage that’s under construction in a harbour park. The lines intrigued me, but there was no way to get a clear line of sight for a shot from outside the construction fence. I tried a couple of times before I got this photo by holding my camera over the fence above my head. It was much to bright to see the lcd screen using the ‘live view’ option, so I focused through the fence, raised the camera, and hoped for the best. Seems to have turned out alright. There’s a couple more shots from the day with this one at Flickr . Well it’s been pretty dark in here for a couple of months. Apologies. I’ve started a full time job with the Surrey Board of Trade and it’s taken a while to get use to the 9 to 5 cycle. More on that later, but let’s just state the obvious for now – it’s very different from being self-employed. Interesting work, great collegues, but the regular hours take some getting use to. It’s coming, but it’s taking some time. With that short introduction to let you know where this post is coming from, I wanted to publicize something the SBoT is offering through Dec 22. No, I won’t get a kickback on this, but I am trying to help my employer. They have a great deal right now that they’re offering with Citislinc International. A tour package to China: 4 Cities, 8 days and 7 nights, all inclusive, for a non-member price of $1,849. Members save $50. The price includes round trip airfare, hotels, airport taxes, 3 meals a day, English speaking tour guides, and admission to a number of events. I’m no expert, but given that the cost of air alone runs close to a grand in Canadian bucks http://www.flychina.com/LFW/LowFare.aspx , this sounds like a pretty good deal. If you’re thinking of doing business in China sometime, the organizers can set up some meetings with people in your industry. If you just want to tour around, that’s fine too. There’s an information session about the trip on December 12 at the Sheraton Vancouver Guildford Hotel between 7 and 9 pm. Final deadline for a $125 deposit is December 22. Give them a call at 604.581.7130. Now (hopefully) back to regular programming. I spent the beginning of the week over on Vancouver Island. My sister invited me over to go to the folk festival on Sunday, and I attended an industry meeting between Monday and Wednesday. I spent the rest of the week catching up on all the blogs, emails, and newsgroups that I subscribe to. Whew. Gotta get a life. And soon! Oh, and I met with a potential client (that didn’t pan out). Anyhoo…I enjoyed the visit with sister and family. We BBQ’d some lunch and headed off to the FolkFest, but gave up, came back, and watched some of the Pink Panther series on DVD. A different kind of day than what we expected. The viewing area for the stage was so limited that performances filled up hours before they started. All the surrounding access was fenced and blocked off with curtains so you couldn’t see anything – even if you had paid admission – and you couldn’t hear anything outside the performance area. We made the most of it by having a bite to eat and browsing the various booths for about and hour before we left, disappointed. They should really move that event to a bigger venue. They held it on the Victoria promenade in front of the Empress Hotel, down by the seaplane terminal. Sooo constricted. The Saanich Fairgrounds would provide much more room. Or, they could devote more area to the performances and move the booths further along the promenade. Simpler still, they could open up the curtains once the venues were filled – what better way to attract people for next year. So many options. I hope they do something. There were a lot of disappointed people that I heard muttering….not nice things. It was great to catch up with people at the conference later in the week. I hadn’t seem some of them for about a year. There was a talk about cashews by a plant breeder and I learned that the nut of a cashew is actually outside the apple. Neat. Didn’t know that before.